As someone who practically lives on the Internet, I’m well aware of the frustration that occurs when your wireless connection goes down. Here’s what to do if it happens to you. NOTE: After doing any of these things, you may need to turn off and turn back on any devices that you were using when you were disconnected. Make sure your computer or mobile device’s wireless setting is turned on. Yeah, this is one of those “Are you sure it’s plugged in?” situations. But I’ve accidentally hit the wireless key on my computer many times without realizing it right away and I’ve turned off my phone’s wireless for various reasons and then forgotten about it. If your computer has a physical wireless button, you can see pretty quickly that the light is off. But if it doesn’t, or you’re on a mobile device, you’ll need to go into your settings to make sure you’ve got the wireless turned on. Double-check you’re connected to the right network. If you were connected to another network previously (e.g. at a coffee shop), you may need to reconnect to your home network again if it didn’t reconnect automatically. Reboot your modem and router. Sometimes Internet service providers (ISP) make changes on their end that can change the settings that connect your router to the Internet. The way to fix this is to unplug both your modem and your router (you may have one piece of equipment that acts as both) and wait a full 60 seconds. Then plug them both in again and wait for all the lights to stop flashing. At that point, try to reconnect to the Internet again. NOTE: If someone tells you to power cycle your router, this is what they’re referring to. Click on Network Adapters, which should open a list of them. Find the one that says Wireless and double-click on it. A dialog box will open with multiple tabs. Click on Driver, then click the Disable button, wait a few seconds, and click Enable. If none of the above works, the issue may be on your ISP’s side. If they’re currently experiencing a service outage, they often note it on their website. Of course if the service is down, you won’t be able to check that from your computer. But if your cellphone has a browser you can check it that way or you can phone their customer service number (you may want to program that into your phone if it doesn’t have a browser). Even if they’re not experiencing an outage, their technical support reps can provide more detailed instructions for trying to get your connection working again. TIP: If you get to this point, you’ll often be asked to go into your router’s administration settings. You can be prepared for this by having the login information already saved somewhere on your computer. 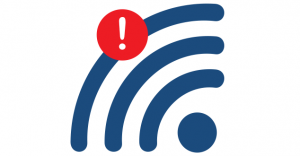 You can usually find the admin URL (it might be an IP address), username, and password on a sticker on your router or you may need to go to the manufacturer’s website to get that information.